Square-Enix wasn't the only publisher at the New York Comic-Con trying to turn a profit. Namco brought, well, everything from their Club Namco online store to the show. 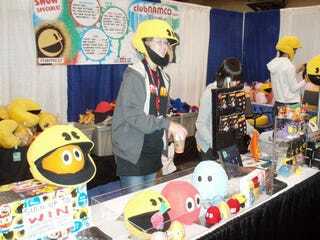 I really, really wanted one of those Pac-Man plushy hats, but it turns out I have to eat this week. Bummer. I also saw some glorious looking Katamari shirts as well.